Geopolitical expediency has forced a people to bargain with the only name history has left them. Reflect on this, before again dismissing them as mere instruments of NATO policy. 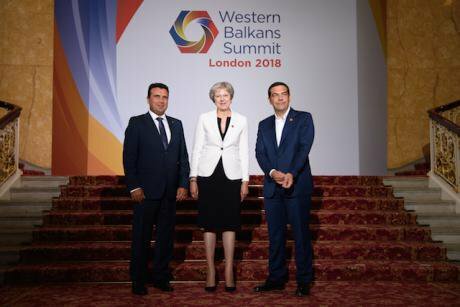 Zoran Zaev, Theresa May and Alexis Tsipras on second day of Western Balkans summit at Lancaster House, London, July 10, 2018. “When you are having a hard time, you call your friends.” The statement belongs to Zoran Zaev, Prime Minister of the (former Yugoslav) Republic of Macedonia – soon to be renamed Republic of North Macedonia, if the deal just concluded with Greece is ratified. The fact that Mr Zaev made this statement during a press conference, a few months ago, alongside Wess Mitchell, the US Assistant Secretary of State for European and Eurasian Affairs, leaves no doubt who he believes his friends to be. Admission into NATO and the EU has been a staple of FYROM’s foreign policy for years – despite the good relationship that the previous government, headed by Nikola Gruevski, enjoyed with Russia. The current government intensified efforts to be admitted into the Euro-Atlantic system, making quite a few concessions in the long-running naming dispute with Greece, so that Greek objections to FYROM’s NATO and EU memberships could at last be lifted. The rapprochement would hardly have taken off if US officials had not made it as clear as possible that they supported FYROM’s Euro-Atlantic integration path, as part of NATO’s grand consolidation project in the Western Balkans. Starting with Slovenia in the mid 00s, this project continued with Albania and Croatia and 2009, and went on with Montenegro in 2017. FYROM is the next step in a course that presumably leads to Serbia, a country traumatized by NATO intervention and friendly with Russia, which still adheres to neutrality. The completion of this project will create a solid NATO-bound Europe right up to the Russian border – a very different strategic situation to the one that existed during the Cold War. The EU is on board with all this, of course, according to the European Commission’s plan to integrate the Western Balkans into the Union by 2025. The speedily deteriorating relations between NATO and the EU, on the one side, and Russia, on the other, are evidently a source of urgency for all these designs, and also the reason why FYROM’s Prime Minister was so confident his “friends” were willing to help. If FYROM’s government considers the US to be its “friends”, then the Greek government’s relationship is positively cordial. Through its policy in the South Mediterranean, in particular, it has touted its determination to be a player in the geostrategic arc that includes Israel, Cyprus, and Egypt. It is obvious that, with an eye to its policies vis-à-vis Syria, Iran and Russia, the US is resuming a more direct patronage of Greek decision-making. The Greek government, for its part, expects to reap multiple rewards: support against the hard-liners in Berlin; economic benefits in the energy game in the South Mediterranean; and protection against Turkey. It made sense therefore to go the extra mile in implementing US policy at its northern borders, too. And, if truth be told, the SYRIZA-led government was in a unique position to attempt a compromise in the naming dispute with FYROM: as a left-wing party, SYRIZA is not as dependent on the hard nationalist vote as its right-wing rivals, so it could handle the political pressure better than just about anyone else. Indeed, polls show that it has weathered the storm as well as could be expected. So, a deal was reached between FYROM and Greece because ending the decades-long dispute became important for NATO and the EU. Criticism of this fact ranges from chastising a party of the radical left for turning pro-NATO in government, to pointing out that NATO militarisation in the Balkans is not necessarily a guaranty of stability and peace. Both these points are obviously valid. However, opposing NATO and EU designs, particularly in view of the possibility of new international conflicts, should not mean disregarding the substance of the deal as a long-delayed –albeit partial– remedy to a grave injustice. Greece has long maintained that Macedonians, meaning the citizens of the Republic of Macedonia, are not a “true” nation, and that their language is not a “true” language. Both these assertions are false. It is difficult to know exactly when people started self-identifying as “Macedonians” in an ethnic sense. But there is evidence that at least by the end of the 19th century some did. The records of Ellis Island show that in 1897 there were immigrants to the US, who stated their ethnicity as Macedonian. In all, about nine thousand people arriving at Ellis Island between 1897 and 1924 declared their ethnicity to be Macedonian. Naturally, there were varied and often contradictory aims and loyalties within the Macedonian national movement. Some participants were loyal to Bulgaria while others supported independence for the region. There were Slavic-speakers who sided with Greek interests (often highly mythologised in Greek historiography). There appeared, also, a sort of Balkan “liberal federalism”, advocating a Macedonia for all Macedonians, regardless of ethnicity or religion. In the spirit created by the Young Turk Revolution of 1908, which promised liberalisation in subject territories of the Ottoman Empire, a movement for a republican, multi-ethnic Macedonia appeared, with some participants inspired by socialist and anarchist ideas. Every national narrative is, in the final analysis, a “construct”. The same is true of the status of a language. There is a famous quip, which pretty much sums it up: “a language is a dialect with an army and navy”. Macedonian nationalism is perhaps the youngest in the Balkans, but it does exist. To say it is a “construct” is a moot point. Every national narrative is, in the final analysis, a “construct”. The same is true of the status of a language. There is a famous quip, which pretty much sums it up: “a language is a dialect with an army and navy”. The “decision” on whether something is a language or a dialect is never a purely historical or linguistic matter, but mainly a political one. It is, therefore, quite a distortion to maintain –as many in Greece, in Bulgaria and in Serbia do to this day – that the Macedonian national consciousness was “invented” by Tito’s Yugoslavia. On the contrary, Federal Yugoslavia’s policy in the region was an acknowledgement of a nationalism that already existed for at least five decades. So, though the process was protracted and incongruous – which is hardly surprising – what emerged between the end of the nineteenth century and the break-up of Yugoslavia was in no uncertain terms a Macedonian nation. Macedonian nationhood is not a fiction – any more than any other “national history” is. It is as legitimate as the next. Being against all nationalisms, in the sense of disapproving nationalist hatred and opposing conflict, is one thing; summarily dismissing a people’s lived perception of themselves as a kind of historical fraud is quite another. Why did the Greek state, as well as a great number of Greeks, treat their northern neighbours like pariahs of history? One reason is indeed the way that the nationalism of the Greek state has been conceived – as a huge, direct leap to ancient glory. Macedonia, in the Greek narrative, can only refer to ancient Macedon – which is what was “liberated” in twentieth century wars. The “antiquization” programme pursued by the political party VMRO-DPMNE and its leader Nikola Gruevski, who was in power in the Republic of Macedonia between 2006 and 2016, did not help matters. Partly invented as a response to Greek recalcitrance, this programme was organised around the claim that contemporary ethnic Macedonians are descendants of ancient Macedonians, who therefore were not Greek. “Antiquization”, however, met with considerable resistance. According to historian Athena Skoulariki, “in the 2015 protests, they were throwing paint on the archaistic monuments and statues. Under the mounted Alexander the Great statue, they wrote: ‘This is fascism’”. Another – far more spurious – reason was FYROM’s “irredentism”. Supposedly, the country that declared its independence in 1991 preserved the historical demand of the Macedonian national movement to liberate the entire region from Ottoman rule, and therefore now coveted Greek territory. Of course, a country that has only 20% of the population of Greece and virtually no military forces cannot reasonably be considered a security concern. And, to add irony to injury, Greece never accepted that Macedonians had had a national movement anyway, preferring instead to think of them as Bulgarians, Serbs or generally “Slavs”, except when discussing them as a threat to its sovereignty. Then, suddenly, they became extremely menacing, always as the brunt of an anti-Greek conspiracy that involved the West and invariably its most willing pawn: Turkey. The darkest reason, though, for dismissing FYROM as a historical joke was avoiding the question: what will become of those who do not fall into the neat categories of negotiated history? What will happen with the ethnic Macedonian minority in Greece? What will happen with the Greek Slavic-Macedonian speakers and their descendants that were deprived of all rights in their country, after they fled as political refugees to Yugoslavia in the late 1940s? Greece has maintained that an ethnic Macedonian minority does not exist in its territory. This was ostensibly a strategy directed against Macedonian "irredentism", which might have sought a pretext in the protection of this minority in order to claim Greek territory. Though there is historical precedent in Europe for such an irredentist manipulation of minorities, in reality Greece has been masking its own policies of forced Hellenization in the region: ethnic Macedonian communities in Greece have been suppressed, from the 1920s to the present day. For decades they lived under police surveillance, and their language was forbidden. Even their songs were banned, and for years they were played as instrumentals, without the lyrics. Statistical recording of this population was stopped (since the state considered the minority non-existent), so there is very little concrete information on its scale or its evolution. Even their songs were banned, and for years they were played as instrumentals, without the lyrics. After the Greek Civil War of 1946-49, there was also a large number of Greek citizens that were ethnic Macedonians, or in any case Slavic-Macedonian speakers, who fought on the losing side and fled to Yugoslav Macedonia. These people were deprived of citizenship and property. They and their descendants have been excluded from all subsequent laws that provided for a right of return for political refugees. These issues are not simply a matter of historical acknowledgment – though that is not in itself insignificant. They are also very much of the present: there is still an ethnic Macedonian minority in northern Greece, and there are still descendants of refugees with no right to return or to claim property. Both these groups are continually deprived not just of the right to have the historical injustices against them officially acknowledged, but also of basic freedoms. It is, therefore, a reason to rejoice that the recent deal at long last acknowledges the Macedonian nationality and the Macedonian language. The Greek government, of course, in an effort to placate nationalist reaction, has stressed that nationality is not the same as ethnicity, and that what the deal acknowledges is not “ethnic Macedonians”, but only “Macedonian citizens”. Also, it has made quite a lot of the fact that in the text of the agreement the Macedonian language is described as having Slavic origin, attempting to appease those who think that Macedonian should only describe the language spoken by Alexander the Great. But both these points, though technically correct, do not change the fact that no acknowledgement of nationality or language could have been achieved without at least an implicit acceptance that the staunch denial of Macedonian nationhood has to be dropped. Still, the deal is hardly fair. Although a “composite name” (meaning to affix some additional designation in front of “Macedonia”, such as “North” which was finally the preferred choice) has been considered the basis of an eventual solution since the beginning, it is far from self-evident that this is the reasonable and just compromise it is purported to be. On the contrary, agreeing to rename their country Republic of North Macedonia is the price Macedonians are paying so that they can be allowed to call themselves what they have been calling themselves for almost a century and a half – without their economy being strangled and their country blocked from participating in international organisations. We should not flinch from saying it: in this dispute, Greece was the aggressor. To put it another way, the only Macedonians that in fact did not need a "composite name" are the citizens of the Republic of (North) Macedonia. The reason should be obvious: they are the only Macedonians for whom "Macedonian" is the primary designation of ethnic identity. Every other Macedonian around is something else first – Greek, Serb, Bulgarian and so on. But no such person, if asked where they are from on a trip abroad, would reply that they are from Macedonia instead of Greece, Serbia or Bulgaria. De facto, all Macedonians in neighbouring countries already have “composite names”. Geopolitical expediency has forced a people to bargain with the only name history has left them. We should perhaps try to reflect on this, before dismissing them once again – this time as mere instruments of NATO policy.